Ruhi Book Seven. Wouldn’t you know it will get tough. In the following post I talk about my struggles with the series of study courses developed by the Ruhi Institute. If you want to know more about the program you can go to their site at http://www.ruhi.org/. If you would like to join a study circle in your area, sent me an email george@sowingpeace.ca or leave a comment on this post. I will do my best to locate active groups for you in your area anywhere in the world. I don’t have this information at my fingertips, but I will find it for you and either send you the contact information or have the group contact you. The Ruhi Study circles are designed to guide the students through a series of Baha’i principles. Often those who have not declared their faith in Bahá’u’lláh have joined study circles to gain the spiritual insights contained in the Baha’i principles. I urge anyone desiring World peace to consider joining such study circles because these principles are universal and help everyone to learn to live in peace with others. Following is my reflection on my current studies. Entering the Section on becoming a tutor is a challenge for me. Suddenly I am forced to examine my own motivation and evaluate what I have learned from the Ruhi Books I’ve Studied. First my motivation. Purely selfish. I find as I am studying these books into which someone has put a great deal of effort, I am not getting it. I know there is more. I know that these study courses are designed to create change and make me a better Baha’i, but I go on much as before. By going over the writings quoted in these books, I am rehashing the importance of action, yet I still fail to be motivated into action. Perhaps by becoming a tutor and repeatedly going through this series of study materials I will eventually get it. So that appears to be my main motivation. Yes, it is my hope that someone else gets it too, but I am striving to learn and be motivated myself and my main hope is that someone will sign up that will help me to do this. Now here’s the big one. In section 4 of the Unit on Becoming a Tutor we are instructed, “turn now to the books of the Ruhi Institute you have already studied and identify five sections, each of which increased measurably your understanding of a spiritual subject.” For 2 days I’ve drawn a blank. Yes, through studying these books I come up with new insights and we get into very interesting discussions. By seeing how other students answer the questions I learn new ways of seeing things, so there is a steady growth, but nothing that I would say has created a measurable change in me. I have been a Baha’i for some time and my understanding of the spiritual principles has been fairly good, but I’m still not getting it. ‘Abdu’l-Bahá says we should lead one individual to the Faith each year, and I still don’t see that happening in my own life. When I see that happening I will know that I got it. Since I am taking a Book one at the same time as book seven, I thought that would give me an advantage. I had taken book one many years ago, so this is my second time. I thought that if I took a glance through the book looking at the purpose and practice of each section something would come to me. This only confirmed that I am not getting it. The section on Prayer in Book One has as a purpose “to understand the importance of daily prayer and to memorize and study 5 prayers.” Although I have memorized at least 5 prayers in my life time, I didn’t increase the number here. I also have not studied in depth any prayers although I have read and reflected upon many. 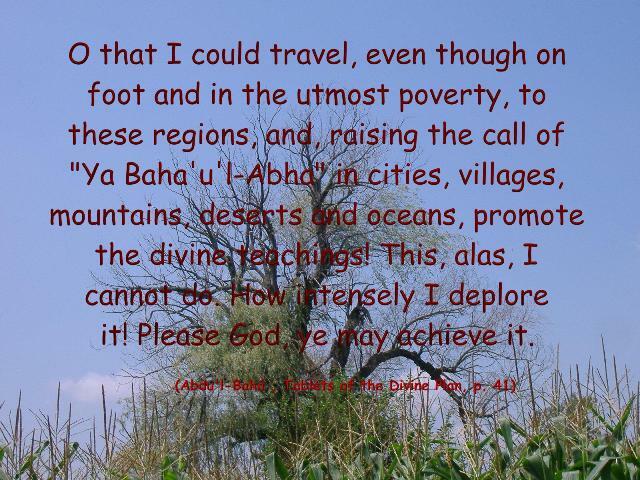 The Practice of this section says to visit at least 2 Baha’is and study a prayer with them. This may be something very easy to do in Columbia where the course originates, but this is North America. I have not lived anywhere outside of Ontario and am not familiar with life styles in other parts of the world, but in Canada one does not just drop in on someone and say he would like to study a prayer with them. This is a great handicap to spiritual development. In this society we are too busy pursuing the American Dream to realize that it is just an illusion. We barely have time to spend quality time with our families let alone get involved in community life. As we become spiritualized I feel this must change. To illustrate let me recount an incident of last evening. I was walking home from work when a young lady came running out of her apartment and asked me to open a jar for her. I am 60 years old and I have never had that happen before. The strangeness of the event forced me to reply with a negative answer. I suspected some kind of trap or ulterior motive, but a quick survey of the area revealed no immediate danger. The lady did not take “No” for an answer and I eventually complied. Now I need to thank her for the lesson she taught me. No this was not in a Ruhi Book or the Baha’i writings, but it was a sign sent from God showing me how sick our society is. If we need help, why should we not ask a neighbor or someone who just happens to be passing by? I thought this action of a young lady to be strange, but what was really strange was my reaction to it. She, out of need, asked a simple favour from someone passing by. I was going to refuse her request on the grounds that this didn’t fit any protocol I was familiar with. What is a community? Is it not a group of people who live in proximity with each other, assist and support each other? In North America we have much to learn about community life. We should be able to drag ourselves away from our computers, TV’s and other gadgets long enough to lend someone a hand. Now to alleviate a community problem I will make an offer. Although I am real estate challenged and do not have a suitable place to invite people, I will be open to anyone studying book one who wants to visit me for the purpose of studying a prayer. They can either come to the store where I am working or we can arrange to meet some other place. I will also make myself available for discussions on peace, spirituality or psycho-social issues. If anyone in the proximity needs a jar lid loosened, I will also attempt to comply. Basically my offer is to become a good member of my community and make myself available to other community members for any purpose where I can be of assistance. By community I refer to anyone within traveling distance of my present location, however I will extend this offer to the cyber world and offer to meet in cyber space with anyone who is connected to the internet. You can meet me at one of my blogs or websites or invite me to your cyber location. 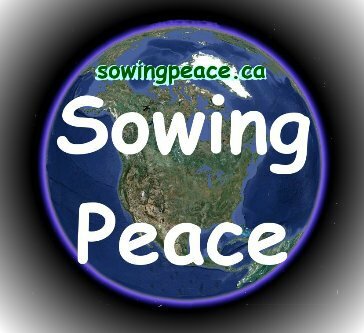 Email george@sowingpeace.ca.